Wilson disease (WD) is a medical condition with a wide spectrum of clinical manifestations. It is one of the common conditions for which clinical opinion of an ophthalmologist is sought. It also helps pediatricians decide on the diagnosis and further management, also prognosticate the disease process. In this case report, a child admitted for renal dysfunction on routine ophthalmic evaluation was found to have a prominent Kayser Fleischer (KF)-ring which then led to further investigation arriving at a diagnosis of WD. Penicillamine gave her only a temporary relief, and she happened to die eventually. 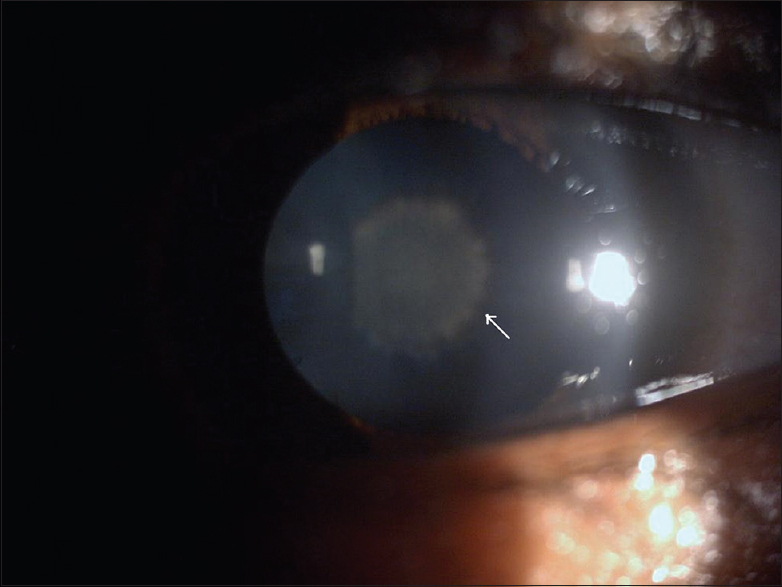 Hence, it is hereby insisted that a prompt clinical diagnosis of KF-ring goes a long way in saving lives in WD if identified at the early stages by a trained ophthalmologist and indicated to a pediatrician. A 12-year-old female child had presented to the pediatrician with hematuria, facial puffiness, and pedal edema for 15 days. History of similar episodes intermittently for the past 7 months. After preliminary blood investigation, urine routine and ultrasonogram-kidneys, ureter and bladder, she was diagnosed as “Lupus Nephritis” with positive ANA and Lupus anticoagulant with deranged PT/aPTT. She was sent to ophthalmologist to look for any ophthalmic features of autoimmune disorders. Visual acuity was 6/6 in both eyes. Cornea had a very dense yellow-brown KF-ring in all quadrants [Figure 1],[Figure 2],[Figure 3], and pupillary dilation showed a central disc of golden brown deposits with spokes of petal appearance over anterior lens capsule indicative of sunflower cataract [Figure 4]. Fundus examination was within normal limits. Based on our ophthalmic findings, the child was subjected to tests for WD, found to have low ceruloplasmin and high urinary copper levels. She was treated and discharged with tapering dose of steroids, mycophenolate mofetil, penicillamine, and calcium. Further follow-up of the child revealed that she developed hypertension, behavior changes, dystonia, dysphagia, focal seizures all of which signified hepatic encephalopathy, and it eventually leads to the death of the child. WD is an autosomal recessive disorder due to mutations of ATP7B gene that encodes copper-transporting P-type adenosine triphosphatase expressed in liver and kidney. Copper is absorbed from daily intake of food (Requirement is 1–2 mg/day ) through albumin into the small intestine and reaches the liver cells by membrane transporters. ATP7B gene functions for binding of copper to ceruloplasmin and eliminates excess copper into bile. Impairment in biliary excretion and improper accumulation of copper into extrahepatic sites such as brain, kidney, cornea, and heart leads to progression of WD. Clinical manifestations of WD include neurological symptoms such as dystonia, tremor, dysarthria, psychological disturbances. Other manifestations such as sunflower cataract, hemolytic anemia, thrombocytopenia, renal tubular dysfunction, hypercalciuria, hyperphosphaturia, hypokalemia, and cardiovascular dysfunction can be seen in WD. In a study where 282 WD patients were reviewed, which revealed that the most involved dysfunction was neurologic deficits (69.1%), followed by hepatic abnormalities (14.9%), hepatoneurologic deficits (3.5%), pure psychiatric symptoms (2.4%), and osseomuscular dysfunction (2.1%); only 5.3% were presymptomatic. Early recognition by means of clinical, biochemical, or genetic examination is very important to prevent the progression of WD. The following are the diagnostic tests used in WD. Hepatic copper level on liver biopsy (>250 μg/g dry weight, normal is <50 μg/g dry weight). Sunflower cataracts are relatively rare, occurring in only 17% of the Wilson patients. Sunflower cataract was first described by Siemerling and Oloff in 1922. It occurs due to copper deposition in the anterior capsule. Posterior capsule deposition appears to be uniform. The sunflower consists of a central disc with radiating folds at the periphery. The radiating folds are thought to be due to the impression of the posterior surface of the iris on the anterior lens capsule, as proposed by Duke-Elder. KF rings are observed in association with the systemic involvement of WD. One study further demonstrated that KF ring presented in neurologic involvement at 100%; in hepatic involvements 86%; and 59% in presymptomatic patients. KF ring was described by the German ophthalmologists Bernhard Kayser in 1902 and Bruno Fleischer in 1903. 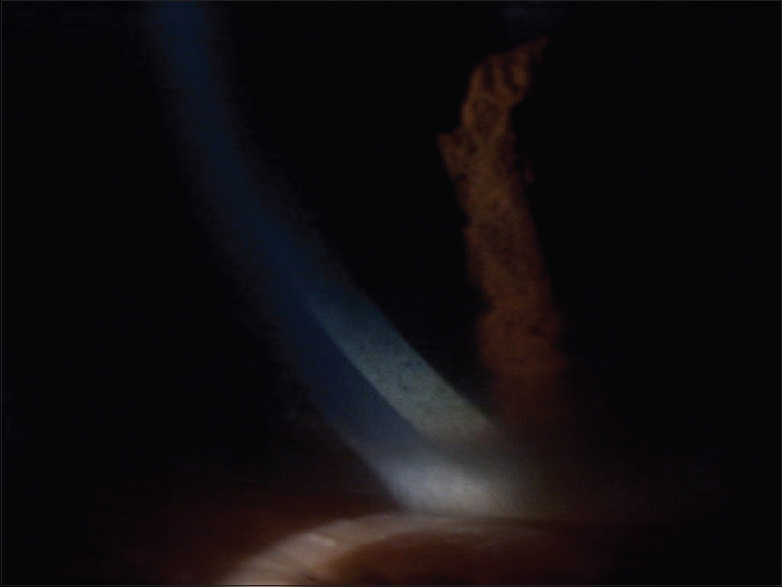 KF ring is due to copper deposition in the Descemet's membrane of the cornea at the limbus. It starts from the Schwalbe line and extends till 5 mm on the corneal surface. It starts in the superior pole as an arc from the 10-to the 2 o'clock position, followed by a similar arc in the inferior pole, and finally encircles the cornea. Free copper loosely bound to albumin enters the aqueous humor and then enters the Descemet's membrane. Innes et al. have reported a case of unilateral KF ring in a patient with WD. 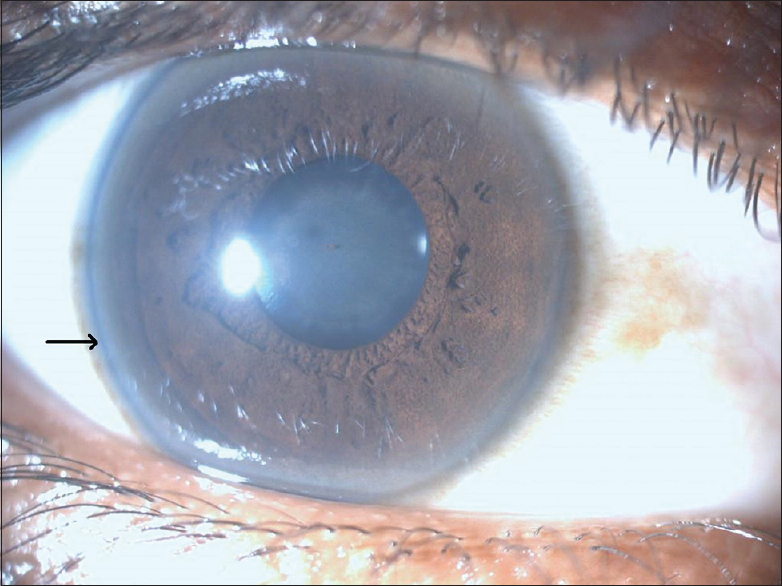 This patient had a scarred eye (with low intraocular pressure and reduced aqueous production) which did not show the KF ring. Hence, they postulated that the copper deposition is through the aqueous (which was markedly reduced in the scarred eye), rather than limbal circulation (which was normal in the scarred eye). Moreover, it may not be just due to passive diffusion but may be attributed to cellular activity, the copper granule production being related to formation of the basement membrane by endothelial cells. The KF-ring resolves in the reverse order either completely or partially following penicillamine therapy  and after liver transplant. Other causes of KF ring other than WD include cholestasis, primary biliary cirrhosis, and cryptogenic cirrhosis. Serum bilirubin level can exclude these diagnoses. On anterior segment optical coherence tomography (AS-OCT), KF ring is visualized as intense hyperreflectivity at the level of diabetes mellitus (DM) in the peripheral cornea. In case if an early KF ring is missed on slit lamp examination and AS-OCT shows hyperreflectivity at the level of DM, the ophthalmologist can go back to look at KF ring carefully with Slit lamp. 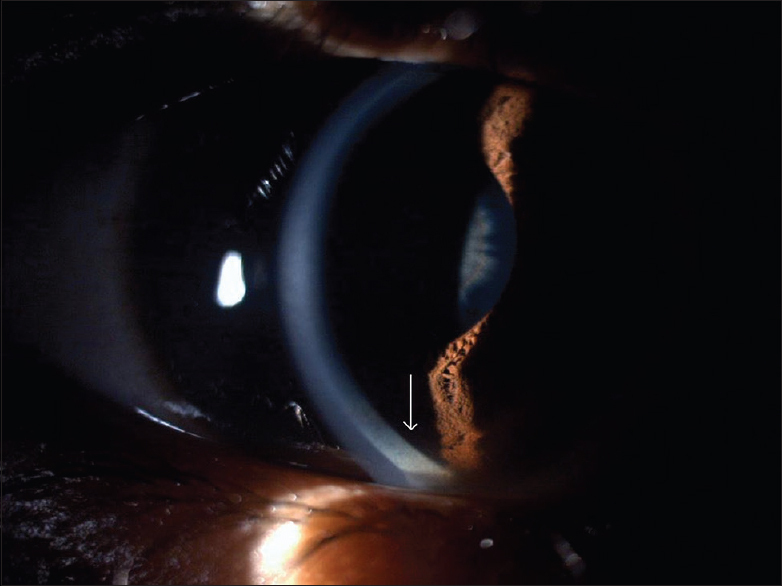 This case is reported for its unique occurrence of a dense KF ring associated with sunflower cataract in a child who presented initially as lupus nephritis. Prompt referral by the pediatrician and identification by the Ophthalmologist has eventually led to the diagnosis of WD. It is insisted that Residents should be adequately trained to identify KF ring as they remain the first person of contact for referrals from adjacent Departments in a tertiary care hospital with Residency Program. Nevertheless, it is to be borne in mind that KF ring does occur in conditions other than the classical WD. Furthermore, the subclinical occurrence of KF-ring in suspicious cases can be identified with the help of AS-OCT.
Ramya Silpa S, Chidvila V. Wilson disease. Int J Pharma Res Rev 2013;2:18-23. Pfeiffer RF. Wilson's disease. Semin Neurol 2007;27:123-32. Taly AB, Meenakshi-Sundaram S, Sinha S, Swamy HS, Arunodaya GR. Wilson disease: Description of 282 patients evaluated over 3 decades. Medicine (Baltimore) 2007;86:112-21. Masud H, Bashir T. Kayser-Fleischer rings in Wilson's disease. Pak J Ophthalmol 2014;30:112-6. Lin JL, He MS, Tsai RT. Ocular manifestations as the initial presentations of Wilson disease. Taiwan J Ophthalmol 2013;3:173-5. Amalnath DS, Subrahmanyam DK. Ocular signs in Wilson disease. Ann Indian Acad Neurol 2012;15:200-1. Rajasekhar P, Parnikumar M, Sahithi J. Kayser-Fleischer ring as the initial presentation of Wilson disease – A case report and review of literature. Int J Sci Res 2015;4:626-7. Harry J, Tripathi R. Kayser-Fleischer ring. A pathological study. Br J Ophthalmol 1970;54:794-800. Suvarna JC. Kayser-Fleischer ring. J Postgrad Med 2008;54:238-40. Sridhar MS, Rangaraju A, Anbarasu K, Reddy SP, Daga S, Jayalakshmi S, et al. Evaluation of Kayser-Fleischer ring in Wilson disease by anterior segment optical coherence tomography. Indian J Ophthalmol 2017;65:354-7.